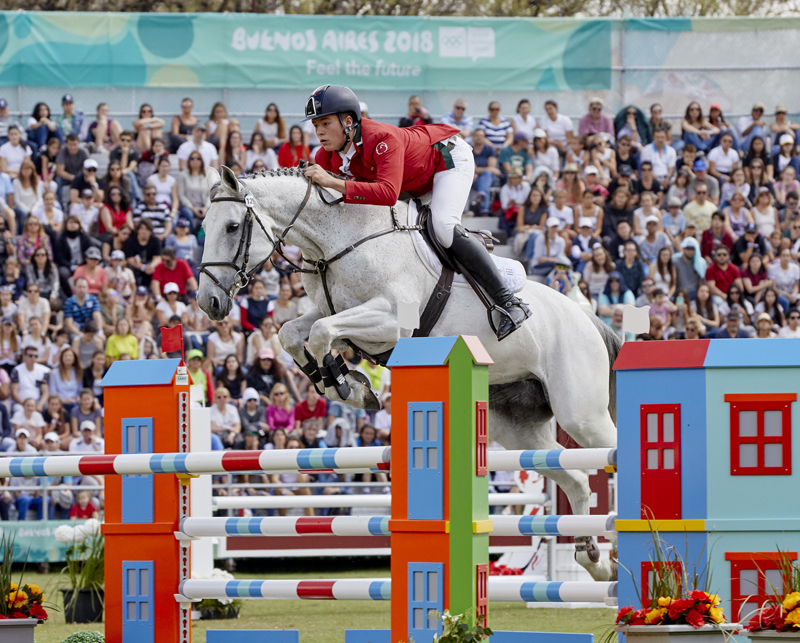 A day of fantastic sport capped off the equestrian events of the Youth Olympic Games Buenos Aires 2018 with a last decisive dash for the individual medals in a five-way jump-off. USA’s Mattie Hatcher was first to enter the arena for the jump-off, as she set out an impressive pace with her mare Santa Rosa Valery but knocked two fences along the way. Next into the arena was the UAE’s Omar Almarzooqi, who successfully produced the first clear at a very reasonable pace of 34.37s to pick up silver, followed by Italy’s Giacomo Casadei, who went and produced the second and final clear round of the jump-off beating Almarzooqi’s time by nearly three seconds at 31.79. The pressure was on for Argentina’s home-grown hero Richard Kierkegaard as he entered the arena to huge acclaim, and under pressure to secure a clear and fast round. It was unfortunately not to be for the local hero, with a refusal and two fences down, but the crowds nonetheless gave him a standing ovation as he exited the arena, knowing they would see him again soon! Last to enter the arena, team gold medallist Pedro Espinosa gave it all he had, producing the fastest round but knocking one rail down and picking up four faults to claim the bronze. When speaking to Giacomo via an interpreter, he explained, he did not expect to win at all, and it was clearly the highlight of his equestrian career so far. Having won team silver and individual gold, he clearly exceeded all his expectations! From an equestrian family, Giacomo lives in Bologna, Italy, and started riding at four years of age under the watchful eye of his father who is a riding instructor. Before the Youth Olympic Games competitions began we asked Giacomo what his strengths were and he said “against the clock competitions” which clearly is true and he went on to say he sincerely hoped one day to compete at the senior “Olympic Games”, so Giacomo Casadei is one to watch! Both UAE’s Omar Almarzooqi with his individual silver and Pedro Espinosa from Honduras with his team gold and individual bronze are currently the sole medallists for their nations at the Youth Olympic Games Buenos Aires 2018. They have also secured the first ever equestrian medals at the Olympic and Youth Olympic Games! Click here to view the final results.